With the holidays right around the corner, I would like more than anything thing to lock myself in the kitchen for a four day cooking marathon. To me, edible gifts are the best. In a world where everything is take out, cook in a minute, one-pot meals, I find that my friends and family appreciate a homemade treat more than ever. I love sharing my love for Italy through food and what better time to do that than Christmas. This year I have chosen two favorites: biscotti and espresso sauce. I know, you can’t swing a dead cat without finding biscotti in stores, bakeries and cafes, but GOOD biscotti are hard to find. Believe me, I’ve done the research. The only solution is to make them myself. I have scoured the internet and cookbooks for the perfect recipe and have settled on Chocolate Almond and Pistachio Cranberry this year. Just a note, especially to those readers who may be the recipients of my treats: they are SUPPOSED to be hard and crunchy. 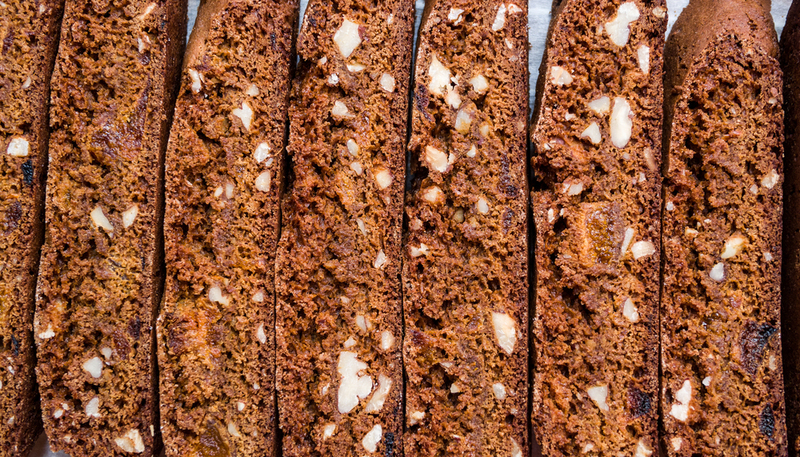 Biscotti means “twice cooked” and are meant to be served with vin santo, an after dinner sweet wine in which the biscotti can be soaked and softened. You can also dip them in coffee. Speaking of coffee, my second edible gift is espresso sauce, a recipe I learned at a cooking class on the Antinori estate in Tuscany a couple of years ago. Though to call this a “recipe” is a bit of an overstatement. The ingredients are espresso, sugar and water. Boil together and reduce. Drizzle over ice cream, as a plate decoration under your holiday desserts or dip your biscotti in it! Italian Cheese Platter – taleggio (delicious) served with walnut raisin crisps, piave, and a fresh (not aged) pecorino are good choices. Truffle Spread - this blend of black truffles and olive oil can be found in specialty stores. Use it on crostini for an elegant hors d’oeuvre. Torrone – this delicious almond nougat candy is synonymous with Christmas in Italy. David Barbero makes a wonderful chocolate covered variety that can be found at Eataly. Prosecco – anyone who follows my blog regularly knew that this had to be included. It is a welcome gift for any wine love. Easy to drink and festive. My preference of those that are readily available here is Nino Franco Rustico - cin cin! I hope your holiday is full of tasty treats – ‘tis the season!